Oakland, Calif., December 19, 2013: As a dry December accentuates the stress on California’s limited water supplies, the success of the state’s energy sector in implementing efficiency programs offers valuable lessons to the water sector. A new report from the Pacific Institute examines the rules, regulations, and policies that promote energy efficiency and finds models for water management in drivers like the energy sector’s appliance standards, building codes, pricing policies, and utility-sponsored efficiency programs. 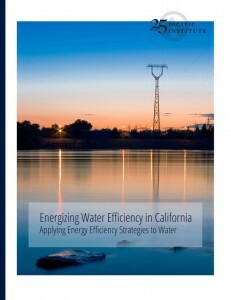 The new report, Energizing Water Efficiency in California: Applying Energy Efficiency Strategies to Water, can be downloaded free of charge from the Pacific Institute website at www.pacinst.org/publication/energizing-water-efficiency.